We never lose sight of our defining core value: At RAD Computing, IT is personal. RAD delivers personalized IT support services, cost-efficient budgeting, and epic response time. When you call, you'll always speak with a real tech. We are your trusted partner for IT management, cloud solutions & security. We go above and beyond with our 24/7 Emergency Response time. We're organized, efficient, solution-oriented, and take care of everything. From simple consultation to full system upgrades, our energetic team is ready to help. When we relocated multiple companies to a new main office, RAD Computing took care of everything IT-related from start to finish. They’re always just a phone call or email away… we especially like the way they can fix almost any issue from wherever they are. We recommend RAD Computing for their excellent customer service. We especially appreciate their team’s patience in dealing with so many of us who do not have an IT background. RAD Computing has been alleviating our IT issues for the past five years with great results and minimal downtime. Their team is responsive, from the initial phone call to onsite support. Now we rely on their expertise for all IT decision-making. With computer technology changing by the minute, we rely on RAD Computing’s staff expertise to keep our system up to date and running smoothly. This allows me to focus on other business essentials. I honestly don’t know what we’d do without RAD! RAD Computing is responsive, understands our sense of urgency, and is our one-stop shop, regardless if the problem is hardware, software, connectivity-related or anything else. RAD helps us minimize downtime, which helps us serve our customers better. My company and I are very pleased with RAD Computing’s latest work. In impressive time, their staff set up new computer equipment and new users, updated programs for other users, and got rid of a virus on our accountant’s computer offsite. Everything’s working perfectly! As we grew from one server to a multi-server environment, RAD Computing was always there to provide us with a high level of service. They are a valuable resource for our organization. Just simply, thank you to RAD Computing. When your staff comes to our locations for tech support, they always listen and never make us feel like we’re not technology-savvy. When a client upgraded their software program and needed us to integrate our business processing, RAD’s involvement made things go smoothly. Despite the project complexities, their team’s calm, professional attitude got the job done. I was at ease throughout the process and thrilled about the happy ending! Since 2004, RAD’s advice and support have kept our business ahead of the IT curve. As we’ve grown, we’ve increased server functionality, added new employee workstations, mobile devices and more – all while maintaining network security. I have been dealing with RAD Computing for many years now and find them to be top notch service provider. I have had a couple of incidents where my network went down on a Sunday and RAD was right there to help by phone and on site. They will do whatever it takes to get the job done! Very fast response, and great pricing. We have worked with Rad Computing for many years. They are very professional and supportive to all business owners. I would highly recommend them for your IT needs. Intelligent and professional. I have been working with RAD Computing for over 7 yrs. I have had many machines that have broken and RAD has either repaired the machine or replaced them. They offer excellent, timely customer service and very competitive prices. I would highly recommend RAD for your business IT needs. They are a great team to work with. RAD works as your IT services partner or as an extension of your in-house staff. Ongoing monthly support plans are customized to meet your operational and budget needs. We offer complete setup and support services for IT Management, from initial assessments and product purchases through network support and data backups. We take the time to thoroughly understand your business and IT operations. No matter your size, security is a giant priority for all of our clients, and our knowledge of your systems is vital to having proper security in place. Though relatively new, cloud products such as email and data storage are extremely dependable and cost-efficient options. We can help you understand how they can fit into your IT operations, and provide the perfect solutions to meet your needs. RAD Computing of Connecticut provides information technology (IT) services to trusted small and mid-size businesses in the Northeast and beyond. The company was founded in 2000 by Rod Wilson, Sr. and is based in Connecticut. We have grown in size and capability since then, while never losing sight of one defining core value: at RAD Computing, IT is personal. For our customers, that means close, personalized service, customized computer networks and prompt response times. Every day. On every project. We have the knowledge and resources to handle your Server, PC, Mac and network acquisitions, installations and configurations. Even if you want to supply your own hardware, we can easily install and configure it for you. Our staff will maintain, administer and support your computer network onsite or through remote network access. We cover the spectrum of IT Consulting services that include IT management, IT outsourcing, IT network assessment and computer networking, IT consulting, home and business computer repair, and other computer IT support services. Whether you have a minor mishap or major emergency, we are available 24 hours a day, 7 days a week. Our IT consulting firm is ready to give your business our personal attention and help you succeed. From first-time purchase decisions to existing system upgrades, through full IT support and disaster recovery, RAD has an energetic and experienced team that will work together with you. We are certified technicians who have expertise in both Mac and Windows. We make sure our IT consulting firm is always current on the most recent virus and security threats your computer may be facing. We speak tech babble, and we’ll translate it so you are comfortable with everything before, during, and after our computer repair. 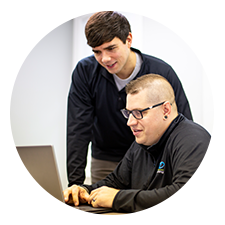 Unlike general IT companies, we are certified and trained to handle all your managed IT services, which means we have demonstrated competence in computer repair, networking, troubleshooting, and security. We make it easy for you to get your computer back up and running at its best, with IT services that are convenient for your schedule and your wallet. Our IT consultants are very diverse in their knowledge here at RAD – we know a lot about a lot of things. We pride ourselves on the level to which we’ll go to accommodate our CT customer’s needs. Our goal is to be your complete one-stop IT shop. Without a doubt, we have an experienced and patient team of computer repair professionals with decades of experience who are completely plugged into today’s technologies. Our interaction with our clients is important, and we make it a point to have direct communication with them, offering efficient service and rapid response. It is a very intimate, hands-on approach – we know your systems in detail and can help in exactly the way it’s needed most. If you need CT computer support or one of our other IT services, give us a call today at 860.454.7700 to speak with one of our IT consultants. RAD Computing is located at 281 Hartford Turnkpike, Suite 201, Vernon CT, 06066. Our comprehensive services fully support your business. Let's make your IT work for YOU. We're here to help you succeed. Contact us now! RAD is hands-down the best IT support company. The staff is very knowledgeable and attentive to the needs of our company. They provide valuable peace of mind in knowing that whatever issues may arise, the gentlemen at RAD are able to handle it with the appropriate level of urgency, skill, and always excellent customer service. RAD is also versatile. We have used RAD's services for ongoing office IT monitoring, support, and equipment needs for over 5 years. They have also provided services recommending and setting up technology solutions on new construction projects as a valuable part of the project team. I recommend RAD highly for any IT projects. We have been a client of RAD Computing for over 14 years. They have always been responsive and professional in supporting my business. We are 100% reliant on our computers for our design work and the data that we keep on our server. I can rest easy knowing that RAD is there for everything I need from the smallest user needs to the large company-wide roll-outs, his team will be there to pick up the phone and answer a support call. They go beyond the support call to explain what is needed in a calm manner and in terms that I can understand. I recommend this company to everyone. RAD Computing is the best! Their knowledgeable staff are always willing to help us quickly whenever we encounter problems or issues. They are fast to respond, and explain all aspects of any issues we may have. I enjoy the personalized service and it is always with a smile. I highly recommend them to anyone wishing to have exceptional IT service! In the several years we (speaking from a business) have used RAD Computing, we have had top rate support. Their knowledge has always stayed up to date with the ever changing technology which, in turn, has allowed us to make educated decisions on ALL of our computer needs. There has not been a single time when I have not been able to get in touch with anyone either! My favorite thing about RAD Computing is that they talk to me like a real person and are well aware that I am not on the same technological level with them but still make sue I understand everything! Hands down, if you're looking for IT people, whether it is for business or personal, RAD Computing is the way to go!! © 2019 RAD Computing. All Rights Reserved.